Calcium is an essential mineral needed for the maintenance of normal teeth and bones, but which also contributes to normal energy-yielding metabolism and muscle function. 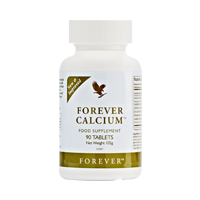 Forever Calcium contains a high source of the mineral but it’s also high in vitamin D and magnesium. Take 4 tablets daily with water. Calcium bisglycinate, calcium citrate, calcium carbonate, magnesium oxide, stabiliser (microcrystalline cellulose, silicon dioxide), anti-caking agent (croscarmellose sodium), calcium ascorbate, magnesium bisglycinate, anti-caking agent (stearic acid), glazing agents (sodium carboxymethylcellulose, dextrin, dextrose, medium chain triglycerides, sodium citrate), acidity regulator (citric acid), zinc bisglycinate, manganese bisglycinate, copper bisglycinate, vanilla flavour, cholecalciferol.